Our unique collection of illuminated trees features a range of styles and sizes. Each flexible branch is highlighted by dozens of long lasting, warm white LED bulbs and can be decoratively shaped to your liking. 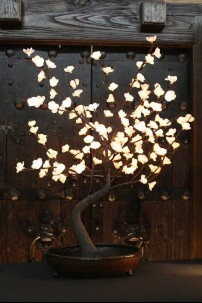 WILLOW TREE 36" W/96 WARM WHITE LED'S 184162 This is the perfect little table topper tree. It..
White Bonsai Tree with 128 Light LED 32" Unique illuminated tree! Perfect for a table topper ..